The fine, weather boarded gambrel house on the corner of Main and North Streets in Plymouth, Massachusetts is one of the most significant houses in early American history. The house was originally constructed in 1726 by British General John Winslow (1703-1774). General John Winslow was the great grandson of Edward Winslow, the famous Diplomat of the Pilgrims. Edward Winslow sailed to the colony of Massachusetts on The Mayflower and served three terms as Governor of the colony. General Winslow is renowned as one of the most distinguished military leaders of his time in New England. He served the British Crown in the 1740’s in an expedition against Spanish Cuba and was involved in the British seizure of the French Fort at Louisburg in 1745. He also led an expedition against the French in Maine in 1754. He is, however, primarily remembered as being the British officer in charge of the Evacuation of the Acadians from Nova Scotia. His portrait, painted by Joseph Blackburn, hangs in Pilgrim Hall in Plymouth. The house and its occupants represent the split in the British Empire that occurred towards the end of the 18th century. In 1757 James Warren and his wife, Mercy Otis (sister of the famous Colonial Jurist, James Otis of Barnstable) moved into the house. The Warrens were among the leading Patriots of the Revolutionary era. While residing at the house James Warren was elected from Plymouth as a member of the House of Representatives. According to Mercy Otis Warren’s History of the Rise and Progress and Termination of the American Revolution (Boston, 1805), which was written in the North Street house, James Warren (an attorney) and patriot Samuel Adams hatched the idea of the Revolutionary Committee of Correspondence to inform other colonies of colonial reactions to British violations of the Constitutional Rights of American Colonists. It is more than likely that these important American Revolutionary History discussions took place in the Winslow-Warren House. Author Nancy Rubin Stuart asserts that James and Mercy often hosted meetings with John and Samuel Adams and other Sons of Liberty at their fireside in the house during the tumultuous years leading to the American Revolution. In 1773, in this house, Mrs. Otis Warren wrote the satiric drama, The Adulator. One year later James Warren, still a resident of the North Street house, was elected a member of the First Provincial Congress of Massachusetts. On June 19, 1775, after the battles of Lexington and Concord, he was elected President of the Provincial Congress. In March of 1790, while a resident in the house, Mercy Otis Warren wrote and published her much acclaimed book of Poems Dramatic and Miscellaneous. It was also from this house that she carried on her famous correspondence with President John Adams and Abigail Adams, Samuel Adams, John Dickinson, James Otis, Generals Henry Knox and Benjamin Lincoln, among many other luminaries of the Revolutionary era. James Warren and Mercy Otis Warren’s portraits were painted by the preeminent American portrait artist of the time, John Singleton Copley. They hang today in the Museum of Fine Arts in Boston. The Winslow-Warren house was built at the height of the influence of the great British architect, Sir Christopher Wren, on American architecture. Although time has eclipsed virtually all of the interior architectural features of the house, the fine wainscoted paneling in the staircase hall ascending to the second floor remains as a tribute to the lasting taste and quality of an era long past. The recent interior hall renovations maintained the original wainscoting while complimenting it with Colonial period style and fixtures. The pitched gable ended roof (gambrel) is also testament to features peculiar to the Colonial version of the Wren-Baroque influence. The main exterior outlines of the house have withstood the pressures of modernity surrounding it and continue to represent a glorious era of American history. Today this historically significant structure houses “Yankee Insurance and Real Estate” (a long standing insurance agency and real estate brokerage company), “The Cornerstone Café” (a delightful family owned and operated breakfast and lunch restaurant with excellent food and friendly service), and “Dillon and Company” (a celebrated antique and classic furniture dealer) all on the street level with the Law Office of Harold F. Moody, Jr., P.C. located on the second floor. 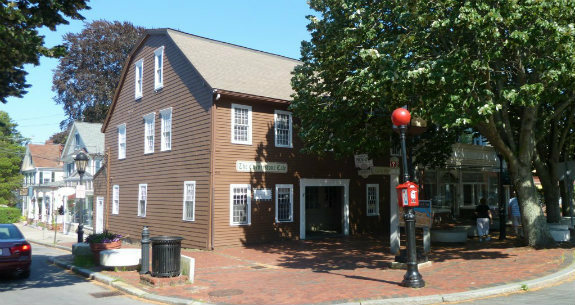 The Winslow-Warren Building is a treasure of a building with an important American Revolutionary Colonial history located in the cradle of historic downtown Plymouth, Massachusetts just steps from the home of the Pilgrims.